Ever heard of boterkoek? 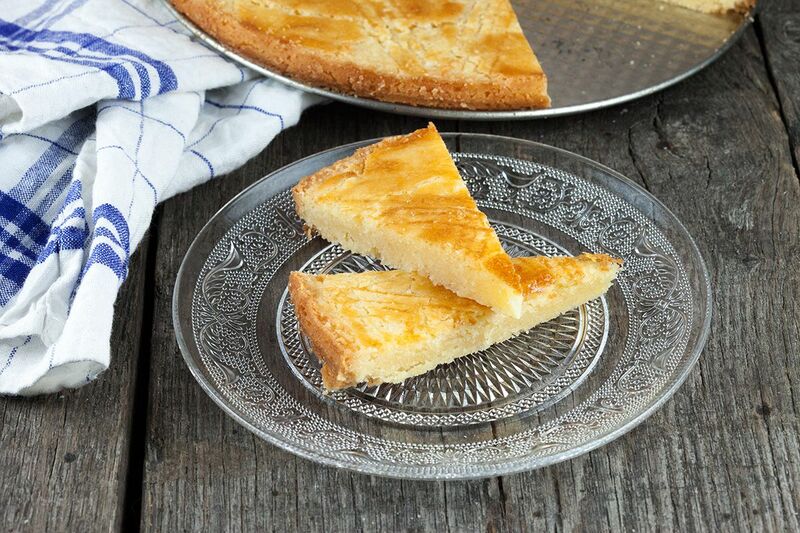 It's a very easy to make Dutch butter cake using only a few ingredients. Recipe for 8 people, ready in 40 minutes. MIX 200 gram butter together with the contents of the packet vanilla sugar (8 gram) along with 200 gram sugar in the bowl of the stand mixer. SIMPLY use a large bowl + whisk if you don’t own a stand mixer. CRACK open an egg, add into the mixture. ADD a pinch of salt and mix well. ADD 250 gram regular flour and mix well. WHISK the other egg into the small bowl using a fork. GREASE the spring form (24 cm) with some butter. DIVIDE the boterkoek dough over the bottom of the spring form. 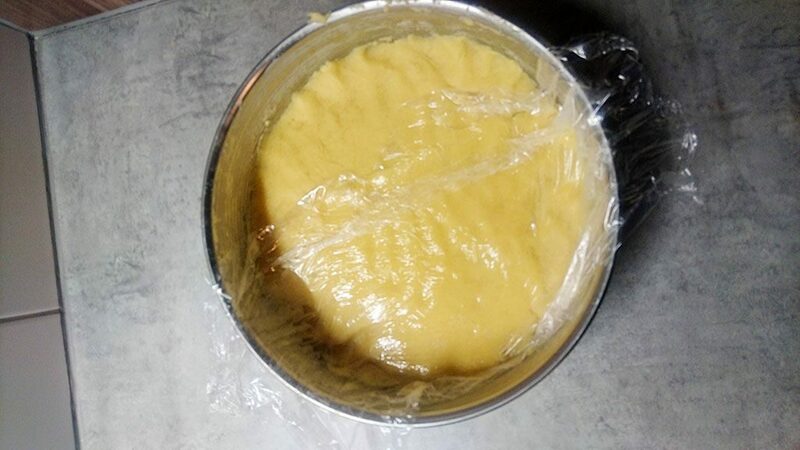 FLATTEN the boterkoek (Dutch butter cake) dough using cling film. Use your hands to press the dough into the spring form. GENTLY brush the top of the boterkoek with the whisked egg. USE a silicone brush for this. CREATE a nice pattern on top of the boterkoek using a fork. PRE-HEAT the oven to a temperature of 180 degrees celsius. 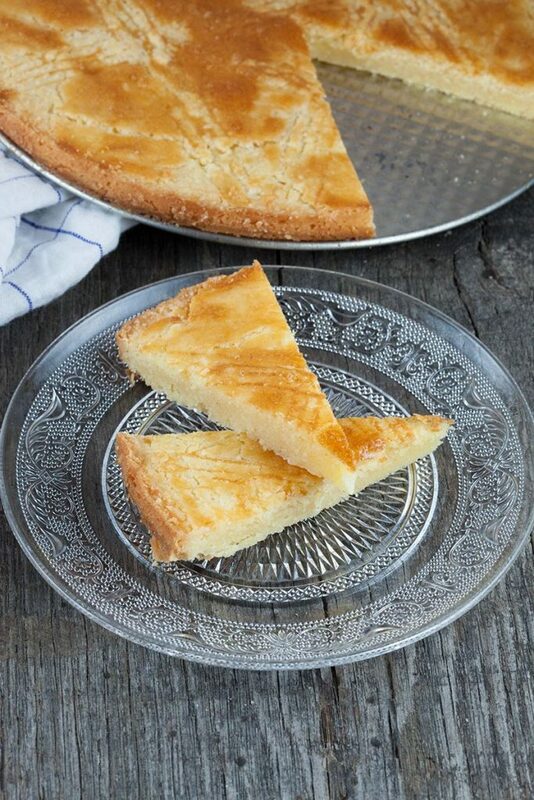 BAKE the boterkoek in 25 – 30 minutes golden-brown. CHECK every now and then while baking. 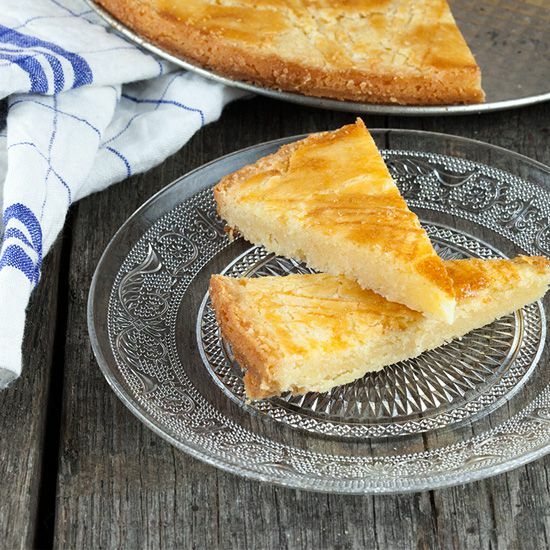 REMOVE the boterkoek from the oven when it’s done and let cool off completely on a cooling rack. THEN place the boterkoek into the refrigerator until hardened. SERVE the boterkoek by dividing it into 8 equal pieces first. I would like to make boterkoek in small (about 12 cm in diameter and 2cm high) baking pans (they have removable bottoms). How long should I bake them and at what temperature? Is the texture when baked more of a cake or cookie? 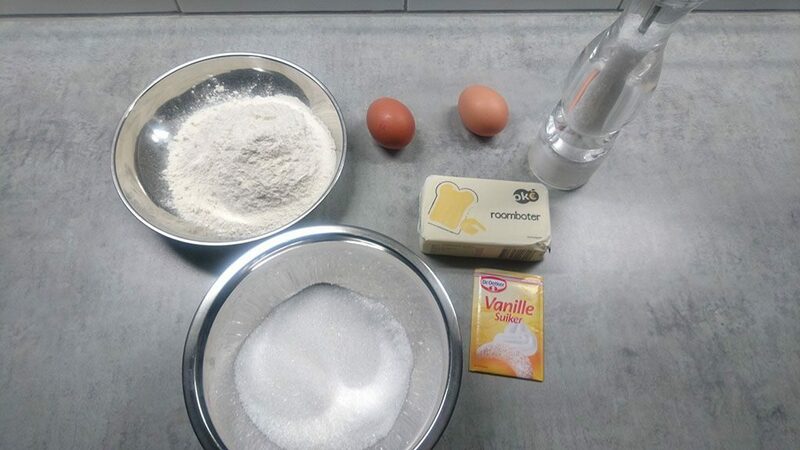 Hi Linda, since the thickness of the boterkoek should be the same for 12 cm baking tins (maybe use a bit less dough) you can bake them at 180 degrees celsius (350 f.) for 25 – 30 minutes. The texture isn’t like any regular cake or cookie, it’s quite dense and solid. Just ask if you have more questions! So, how thick is the uncooked dough in the pan, about 1.5 cm? Hi Linda, 1,5 cm would be about right :) And the uncooked dough has the same thickness as the final cake, since it’s condensed.